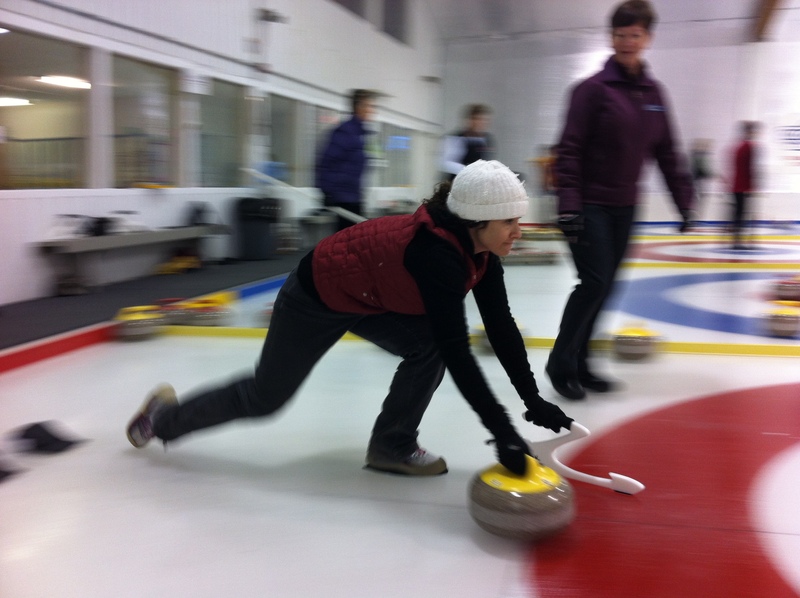 If you, like me, have sat in front of the television, watching a game of curling, thinking…I love this game of strategy and finesse, but let’s be honest here…it doesn’t take much athletic skill to, umm…push a circle-lump-thing down the ice. Come on! If that’s been you, like me, I have to tell you – you were wrong!!! 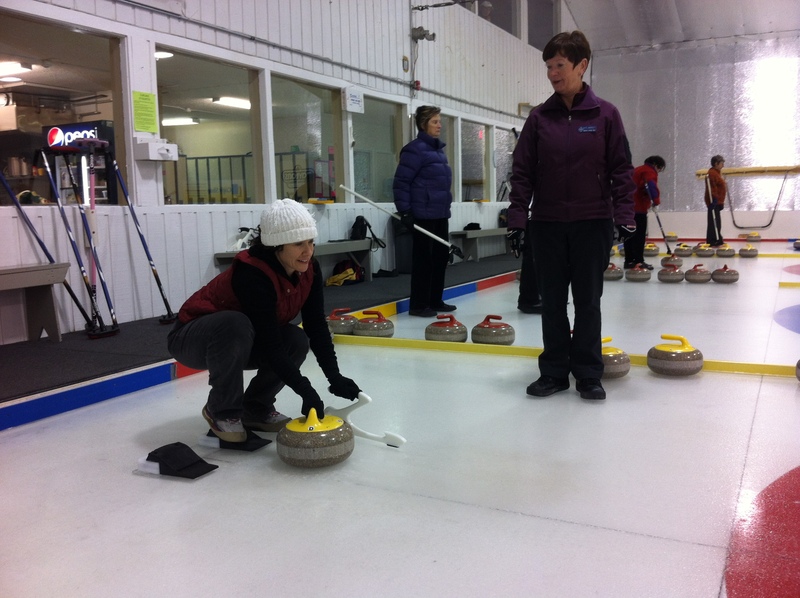 Last night I had the true pleasure of taking a free lesson from Kate and Dave of the Gibsons Curling Club. They are a sweet and lovely couple as well as very excellent teachers, who worked together to teach me and a handful of others that….it’s not as easy as it looks! And then there’s the sweeping! Oh good lord. Once someone throws a rock, you and a teammate will sweep (yes, with a broom!) in front of it to give it more speed and to keep it going straight (if it’s required, based on the throw). And this is where things get really hard…it’s like drug-induced maniacal housework, with people standing next to you screaming “harder, harder, faster…go! !” when you think you’re already going pretty damn “hard and fast.” Which only made me break down in complete hysterical laughter, rendering me totally incapable of continued sweeping. Not, I believe, what they were hoping for. And then finally comes the scoring! You guessed it – my favorite part! The team with the rock(s) closest to the middle circle gets the points. And if a rock is too close to call, they use this doo-hickey thingey to measure (shown in the picture). Points are recorded using numbered tags that get hung on nails on the wall. I loved it! Next time, I want to be scorekeeper! 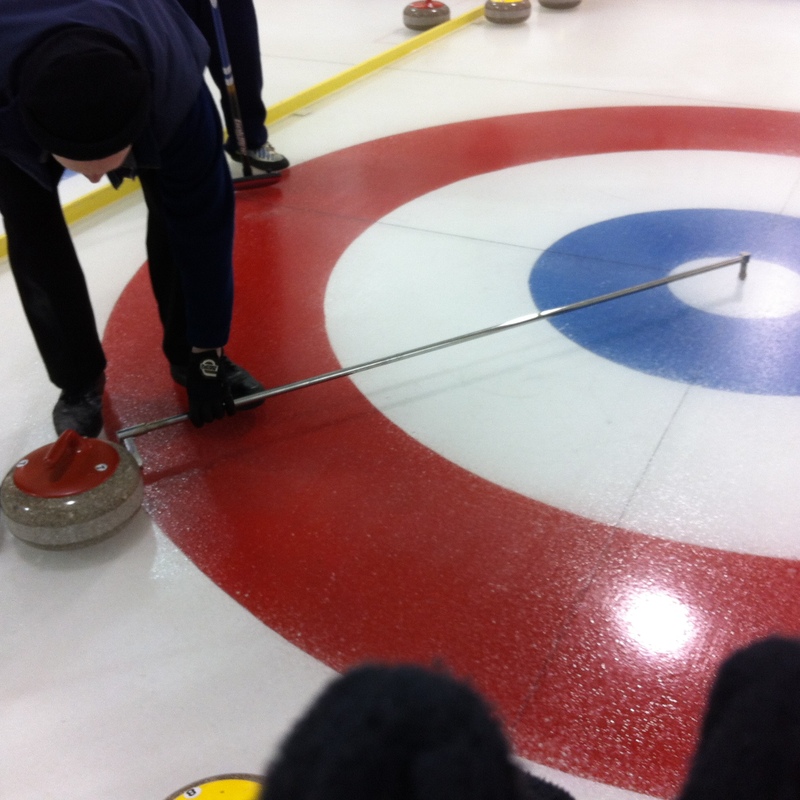 Oh, also…before the game, you shake each of your opponent’s hands and say “Happy Curling! !” And then after the game, you do it again and say “Good Curling! !” These were my second and third favorite parts. This entry was posted in Life on the Road and tagged canada, community, curling, gibsons, recreation, sports, sunshine coast, travel. Bookmark the permalink. 2 Responses to Happy Curling!